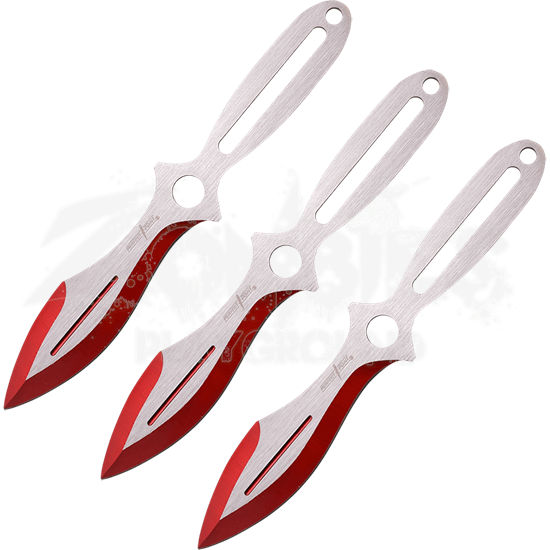 Ideal for professional knife throwing, the Three Piece Red Edge Throwing Knife Set includes a trio of spear point knives that offer good balance and stylish design that will make you the envy of your fellow competitors. Made from durable stainless steel, these knives feature cutouts that make them more lightweight and enhance their forward rotation, improving the chances that they will hit your target with accuracy. The red satin finish on these leaf shaped spear point blades adds an attractive and professional appeal, giving you the confidence you need to win. With a protective nylon sheath that holds all three knifes, the Three Piece Red Edge Throwing Knife Set is ready for you to use as you take your skills to the next level.